No, I haven’t eaten seal meat. Though some of my family members have! Yes, I speak French. Though I feel so rusty at it now and tend to default to using Spanish as a second language. No, Canada isn’t governed by the Queen of England (Tip: neither is England). Yes, it gets very cold. It also gets very hot. No, my father wasn’t born there. But yes! My mother was. And so on. After engaging in conversation with me for about 45 seconds, the story of my background gets more and more complicated. And, I suppose, for some people, it’s fascinating. A black girl from Canada. Almost like a unicorn. I realize that there are deep and valid reasons for this, but that’s another topic for another day. But, to me, it’s just my story. I grew up in Montreal, Quebec, born to a Trinidadian father and Canadian mother, whose parents were Guyanese and Bajan (from Barbados). My father came to Canada from Trinidad for university where he met my mother. On my mother’s side, the immigration story began a generation prior when my mother’s parents came to Canada from Barbados and Guyana in search of opportunity. My extended family included relatives from Jamaica and St. Vincent and Bermuda and more. When I came along, it was into a family deeply rooted in West Indian culture and always celebrating the diversity of the melting pot our family was. In fact, I lived in Trinidad for some time when I was a toddler and spending time in Jamaica, Barbados, St. Vincent and more makeup vivid memories of my childhood. Once I made my way to college in the States; North Florida at that; it quickly became evident that my experience of looking past skin color was going to come to an end. There were black sororities and fraternities and White ones. And, but for a few awkward exceptions, they did not mix. There was the Black Student Union and Black Graduation and blacks hung out with blacks and Whites with Whites. No one seemed perturbed by it – it just was what it was. Falling back on my West Indian upbringing, I joined the Caribbean Students Association (CARIBSA), and I was home again. An strong campus organization with members spanning the colors of the rainbow, but united in their culture, it was the right fit for me and became, undoubtedly, my tribe. I would go on to be on the Board of the organization, compete in the Miss CARIBSA Pageant and also become the Pageant Director. To this day, 2 of my very best friends I met through CARIBSA, and the other I met through the Caribbean Students Association at my CEGEP college in Quebec. What I appreciate about it the most is the perspective that it gives me. We each see the world through the lens of our life experiences, this I know for sure; what I appreciate the most about my life experiences is that they allow me an often unique perspective on issues that I encounter. From appreciating the multidimensionality of people’s heritage to (often) being oblivious to race to embracing cultures far and wide – I attribute much of that to the geography my childhood. Of course, I also attribute a lot of my open and accepting attitude to my parents and family (whom I assume where equally molded by their lives in the Caribbean and Montreal the UK and beyond). Living My Story Through My Craft. You’re the black blogger conference right? We’d love to work with you but we need to pass you over to our ‘African American market segment’ division. You’re just making it harder on yourself. It would be so much easier if you branded as the Af-Am social media event. Oh! We need a black blogger for this campaign (no matter what the subject matter) – you’d be perfect! Can you tell us what Black Twitter has to say about this issue? And while some points make sense, I just cannot bring myself to throw the very essence of me out the window. I stand steadfast in making sure that everyone – from each person on my team to the highest brand exec – knows that Blogalicious is a place to celebrate diversity; to embrace multiple cultures; to reject the typical boxes of race that drive me so crazy. And that one person cannot speak for an entire race or ethnicity or culture because, after all, we are multidimensional folks! This post is part of the Wells Fargo sponsored ‘Untold Stories: Our Inspired History’ campaign celebrating the 150th anniversary of the Emancipation Proclamation and surrounding “The Kinsey Collection: Shared Treasures of Bernard and Shirley Kinsey –Where Art and History Intersect.” Wells Fargo worked closely with the Kinsey family to create a unique celebratory experience that honors the progress of African Americans, not just for a single month, but for the entire year. The Kinsey Collection includes treasured pieces of history and art that commemorate the artistic, historic, and cultural contributions and progress of African Americans prior to and following the Emancipation Proclamation. Go see it!! The exhibit contains a world-class collection of art and artifacts chronicling African American history and culture dating to the 1600s, including an early copy of the Emancipation Proclamation. Learn more about the collection and exhibits, HERE. I’ll be there with my family at the Baltimore exhibit running from November 1, 2013 – January 20, 2014. The exhibit is also currently in Charlotte, NC for a couple more weeks. Sorry but I had to LMAO about the “tell us what “black” twitter has to say” comment. Ah that was a good one. Nice to see you talk more about being a multi cultural “black” woman, something I can relate to and always knew about you 🙂 Big up the Caribbean culture! 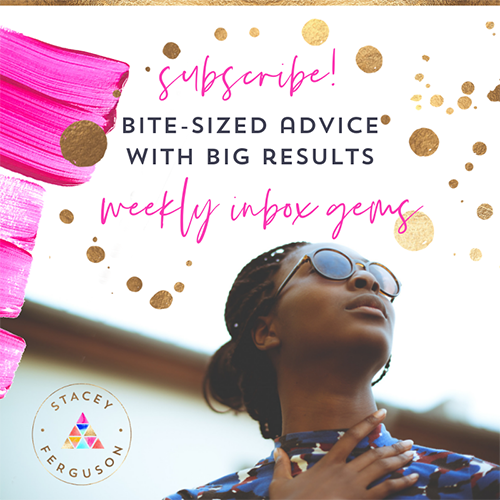 Delighted to learn so much more about you, Stacey, and you’ve raised such great points about how we tend too often to put people in boxes when they are so much more complex. Thank you for sharing this and for all you do to lead and inspire. I love this story! I always suspected some Caribbean culture from you but never asked for whatever reason. Thanks for sharing! From one Canadian in the States to another – I loved this post. My experience immigrating to the US was eye opening and hearing about your experience which was different in many ways is fascinating. Your story is truly amazing and inspirational! I can totally relate, as I have a very diverse family background as well! The Black Girl From Canada: My Untold Story – Justice Fergie Lifestyle Media :: Life IS The Party!